Next week I will be presenting a webinar, organised by ACS CINF (American Chemical Society, Chemical Information division). The title is Practical cheminformatics workflows with mobile apps, so if you have any interest in finding out where the state of the art is at, put aside thirty minutes and tune in. The graphic shown on the right is a snippet from the upcoming presentation. 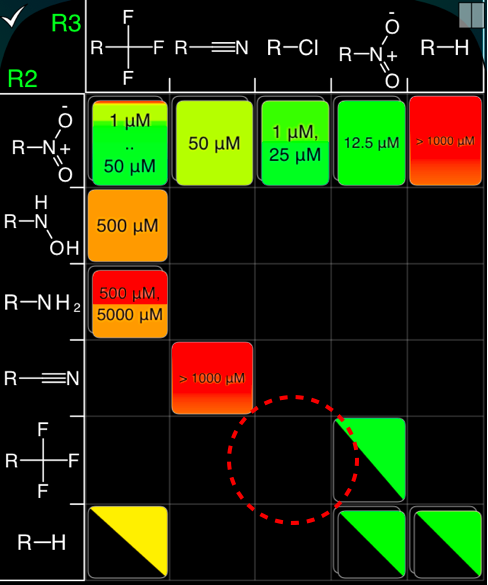 It’s taken from the latest version of the SAR Table app, which introduces the ability to interface with a webservice that builds a structure-activity model based on available activity data, and predicts the missing values, which are shown as colour-coded half-squares. It’s still experimental, but it will be making an appearance in the workflow example next week.